Win one of ten Everloc stainless steel bathroom shelves! Complete Home has teamed up with Everloc, the Australian-designed bathroom & kitchen accessories brand, to give you the chance to WIN one of 10 stainless-steel BATHROOM SHELVES (valued at $49.95 each). Featuring the new patented dual-action suction technology, this stylish shelf provides the ideal storage solution for your shampoos and soaps and is easily installed without you having to lift a drill or a screwdriver. To win, all you have to do is register and tell us in 25 words or less why you’d like the Everloc bathroom shelf, and you could be one of 10 lucky winners! 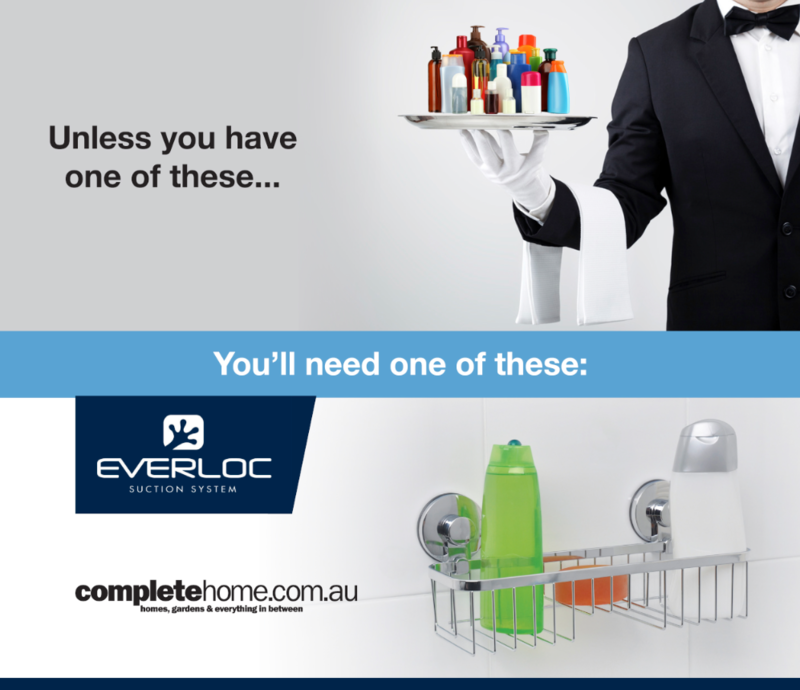 Everloc understands that Australian homes need contemporary storage and has designed a modern range of accessories for the bathroom, kitchen and laundry that supports up to 15kg. From shower caddies and towel rings to bathroom shelves and hair straightener holders (genius idea! ), there’s sure to be a product that will meet your storage needs — even a shaver holder for dad (great gift idea for Father’s Day!). Eveloc requires NO tools, NO drilling and NO screw-driving to install and will leave NO damage on surfaces, which is ideal for renters, DIYers and those keen to keep a contemporary on-trend look to their home by updating regularly. All accessories can be reinstalled time and time again — so perfect if you are on the move. Everloc’s new dual-action suction technology comprises an internal silicon ring that acts as a secondary seal by smoothing away any small surface imperfections for failsafe functionality, and consistent weight bearing ability of up to 15kg! Imagine the amount of storage that equates to for your home! Register and tell us in 25 words or less why you’d like the Everloc bathroom shelf and you could be one of 10 lucky winners. This entry was posted in CH Competitions on July 17, 2014 by kye. This entry was posted in Paperpocket Competitions on July 8, 2014 by admin.